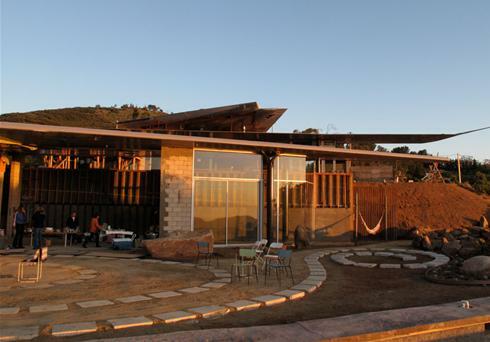 On a 55-acre property in the remote hills of Malibu, Calif., an old Boeing 747 is taking on a new life as the "Wing House." David Hertz. 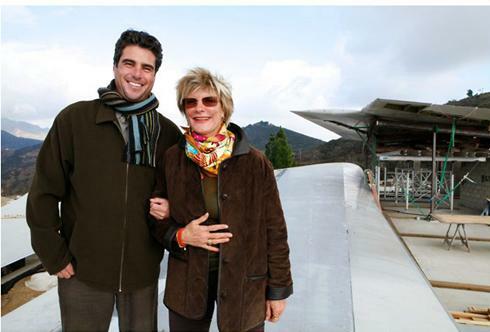 the architect, stands on an aircraft wing, which forms the home's roof, with owner Francie Rehwald. 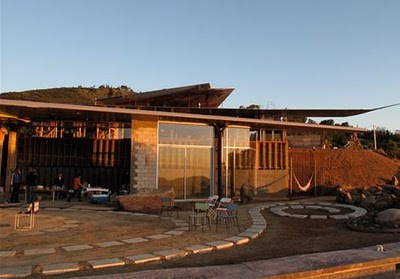 Architect David Hertz came up with the idea after his client Francie Rehwald said she wanted a curved, feminine-shaped home for her lot overlooking the Pacific Ocean. He started sketching shapes and aircraft came to mind. 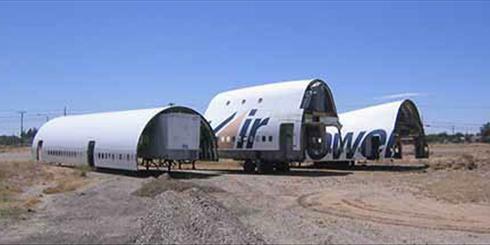 The Boeing 747 was deconstructed into several pieces before being transported from the California desert to a 55-acre lot in the hills of Malibu, Calif.
"Why not use an airplane wing?" he recalls asking her. Rehwald, who co-owns a Mercedes car dealership and loves to recycle, didn't flinch. 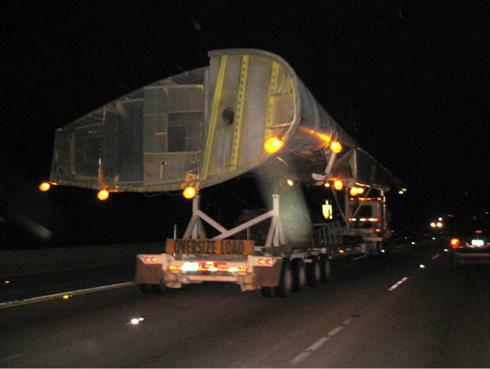 This shows parts of the aircraft being transported to the site. That was about three years ago, and Hertz says the energy-efficient project -- chosen as "This Week's Green House" --- is now about six months from completion as builders finish interior work. "It speaks to repurposing and reuse," Hertz says of the commercial aircraft, which was mothballed along with hundreds of other old planes in the California desert. 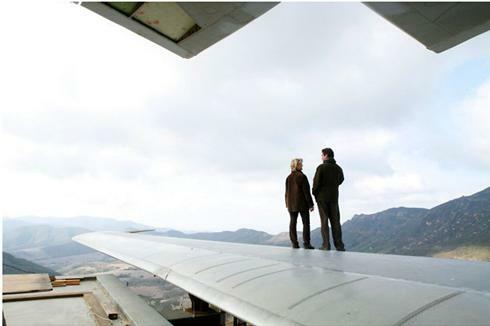 Architect David Hertz and owner Francie Rehwald stand on the home's roof, or aircraft wing, as they look out toward the Pacific Ocean. 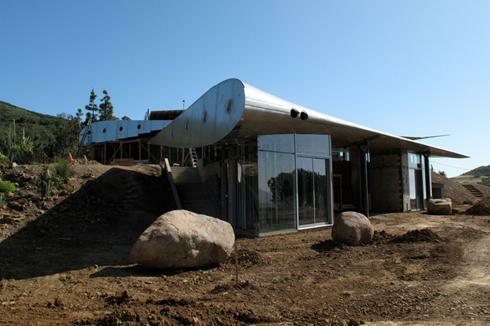 The future home of Francie Rehwald, begun in 2007, is nearing completion. Hertz, who founded Studio of Environmental Architecture, a Santa Monica-based firm, says Rehwald bought the entire Boeing 747-200 for $35,000. She then spent extra to deconstruct it into pieces and transport it to her property. Its parts have been spread over seven different structures. Because it was so huge -- more than 230 feet long, 195 feet wide and 63 feet tall, its parts have been spread over seven different structures. 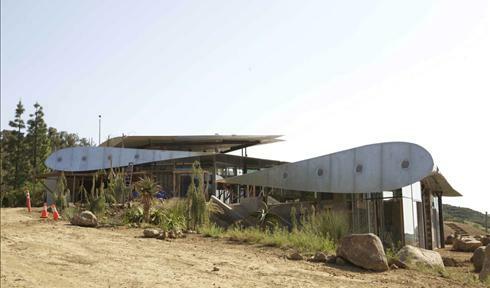 The plane's wings form the main residence while the cockpit has become the "Meditation Pavilion." 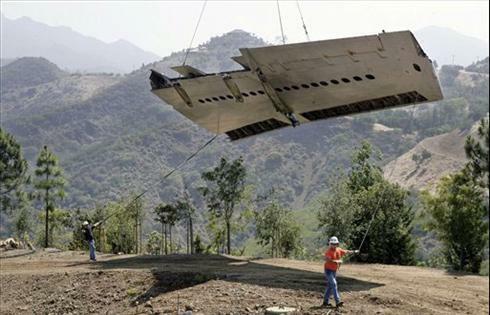 Here, an aircraft wing is being lowered onto the hilly site for construction. 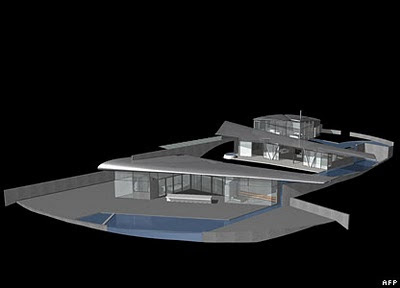 The first class cabin deck is now a guest house, and the lower half of the fuselage, which formed the cargo hold, serves as the roof of the "Animal Barn" intended to house endangered species. The process wasn't easy. The remote location necessitated a lot of infrastructure work, including an access road. Due partly to the unique nature of the structure, Hertz says 17 government agencies had to sign off on permits, a process that took about 18 months. He says they had to register the roof of the house with the Federal Aviation Administration so pilots flying overhead would not mistake it as a downed aircraft. Hertz, who's been involved in green building since the late 1970s, incorporated sustainable features such as an 11 kilowatt solar array. 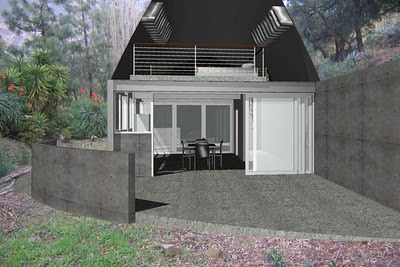 The house also has a cistern for irrigation, plenty of daylighting, non-toxic materials and highly efficient equipment such as a ductless LG heat pump. "We've created strategic openings to promote cross ventilation," says Hertz, who is a fellow of the American Institute of Architects and an accredited professional with the U.S. Green Building Council's LEED (Leadership in Energy and Environmental Design) program. All this doesn't come cheap. Hertz says the home, which has about 3,000 square feet of interior space and 5,500 square feet of roof, will cost about $2 million. 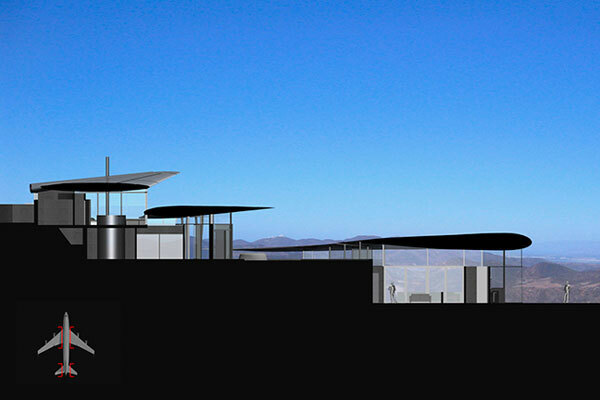 Via Hertz's website: "The Main Residence will use both of the main wings as well as the 2 stabilizers from the tail section as a roof for the Master Bedroom. 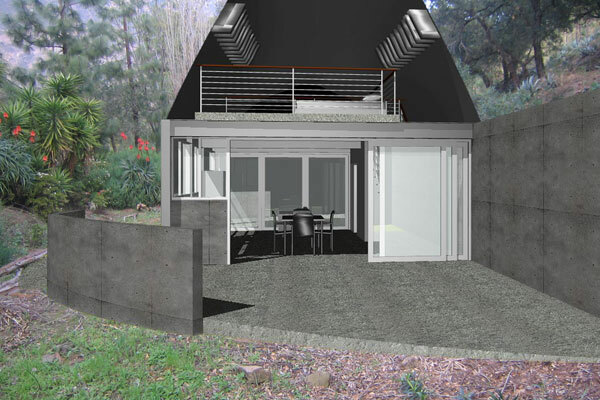 The Art Studio Building will use a 50-foot long section of the upper fuselage as a roof, while the remaining front portion of the fuselage and upper first class cabin deck will be used as the roof of the Guest House. The lower half of the fuselage, which forms the cargo hold, will form the roof of the Animal Barn. A Meditation Pavilion will be made from the entire front of the airplane at 28 feet in diameter and 45 feet tall; the cockpit windows will form a skylight." Incidentally, the house is built on the site of designer Tony Duquette's eclectic Epcot-esque estate, which burnt down in the nineties. 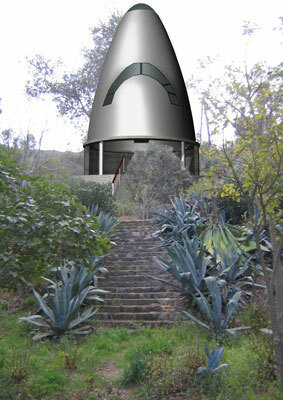 The property was formerly owned by famous designer Tony Duquette and still has many of the "recycled" structures that he installed, although the former residence was destroyed in a fire.